These amazing room furniture is wonderful for fall and winter decorating. Cozy, warm and stylish daybeds and chairs not only look unusual and interesting, but provide functional and comfortable modern furniture pieces for innovative and very personal interior decorating. Floor rugs with USB heaters, armchairs, stools and chairs with knitted seats, furry seat cushions and multifunctional beds impress with original design ideas and innovative structures, adding a unique touch to modern interior decorating. 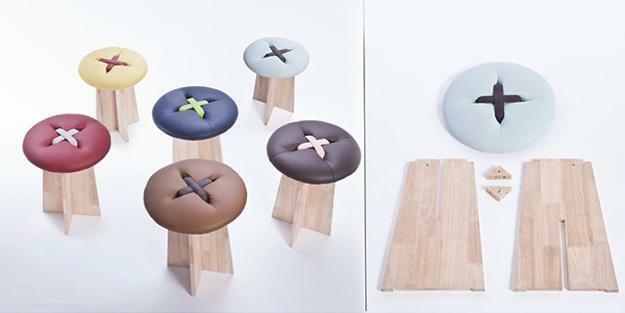 The Ostrich Barstool is designed by Yu Tsai and inspired by Africa. This unusual bar stool features the birds shape and create an amazing seats that make a statement. Elegant and comfortable, the bar stool creates a summer-like, warm and light atmosphere, adding an interesting design adorned with fluffy pompom to modern interior decorating. Multiple layers of the sofa create another unique furniture item, called We are Family. 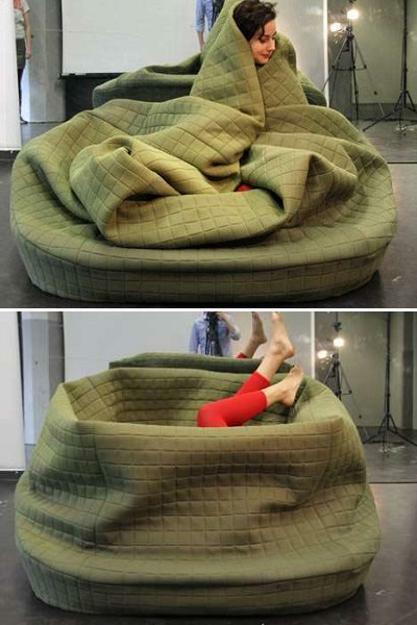 The unusual sofa is designed like a bed for the princess from the famous tale The Princess and the Pea. The sofa features six mattresses which are not attached to each other, allowing to use them separately and create more additional seats and beds. 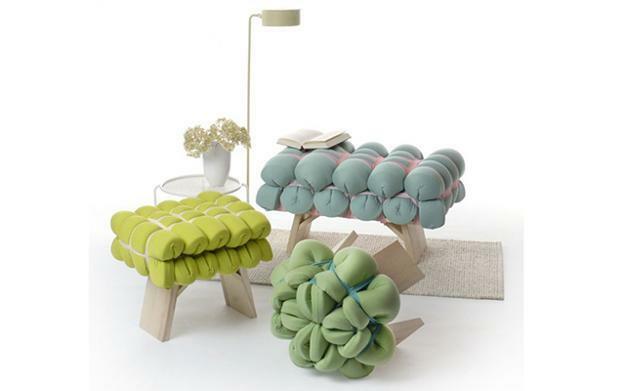 Designer Britta Knuppel created this unusual rug, which provide a warm shelter in winter. The long floor rug Eva is playful and artistic. 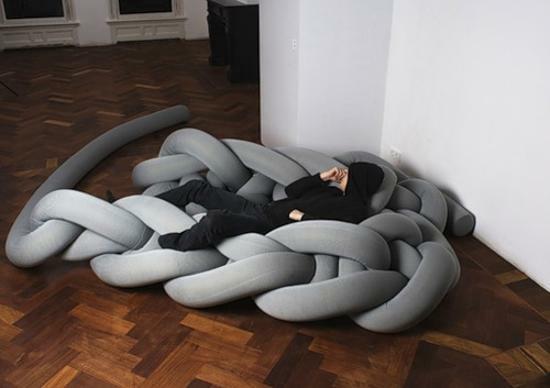 It swirls and twists like a snake, creating a cozy cocoon. A heating system is built into this creative bed. The heater works via USB- cable. Designer Anne O’Brien showed a simple way to make traditional room furniture more comfortable and impressive. Her ordinary chairs are dressed in white knitted sweaters. Great for fall and winter decorating, these handmade upholstery choices make room furniture pieces feel extra warm, pleasant and inviting. 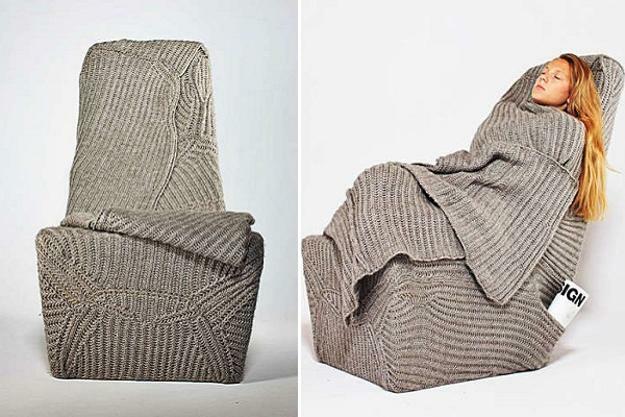 Artist Ana Brzostek from Poland covered her chairs with knitted fabric, adding knitted blanket for ultimate warmth and coziness.These chairs have side pockets, offering convenient storage spaces for small items. 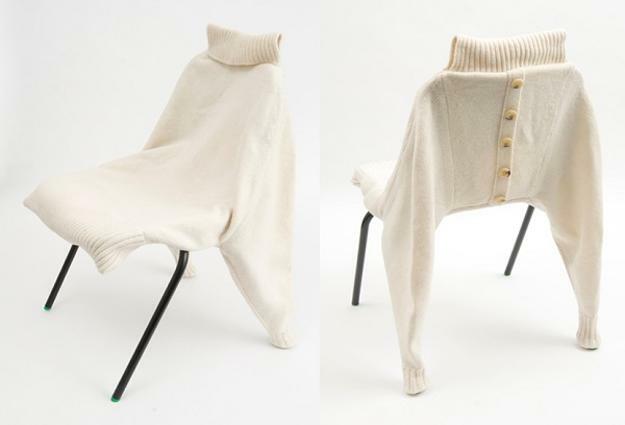 Another dramatic chair is made with knitted fabric also. 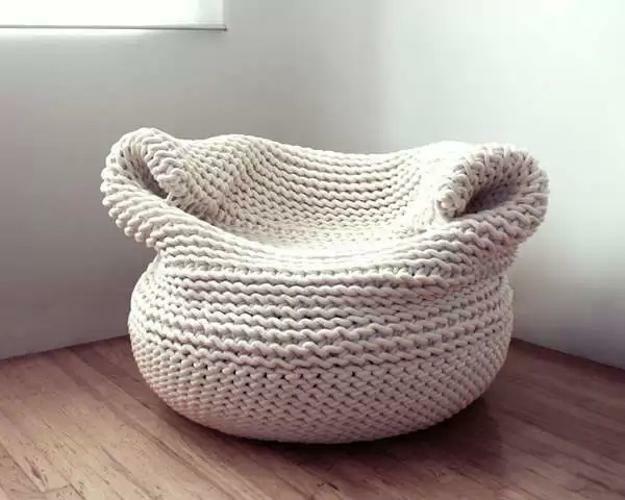 The Bdoja Chair from Mexican designer Amaya Guiterrez looks stunning upholstered with chunky yarn. Jon Helgi Holmgeirsson creates this whimsical armchair. 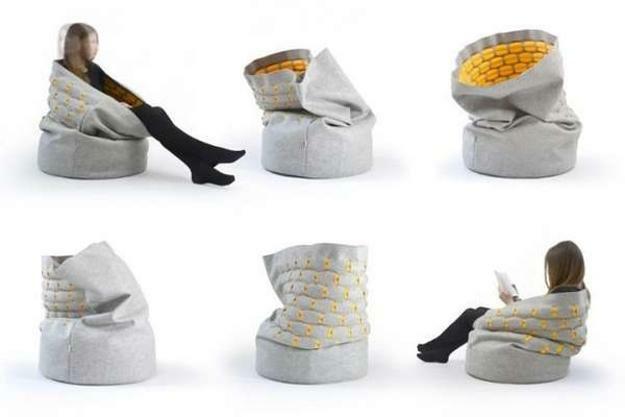 The Sur Ciel Cloud-Chair is an armchair and a mini sofa with a cloud-like hood which will keep you warm and cozy also. 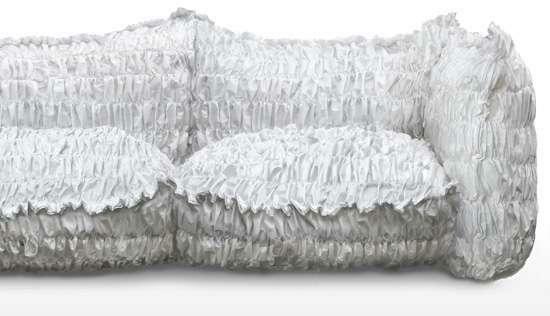 This modern sofa is called Moody Nest. This unique furniture design idea belongs to Hanna Emelie Ernsting and furniture manufacturer Moody Couch. 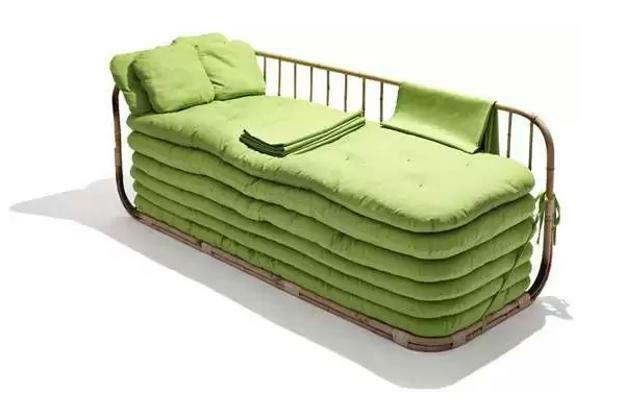 According to the designer, this unusual bed design helps relieve stress and fall asleep, creating warm and cozy environment. 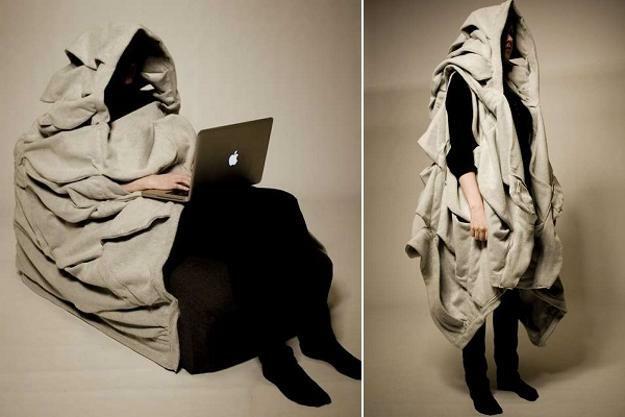 Designers from Kumeko Secrets offered their unique way to hide from fall and winter cold. 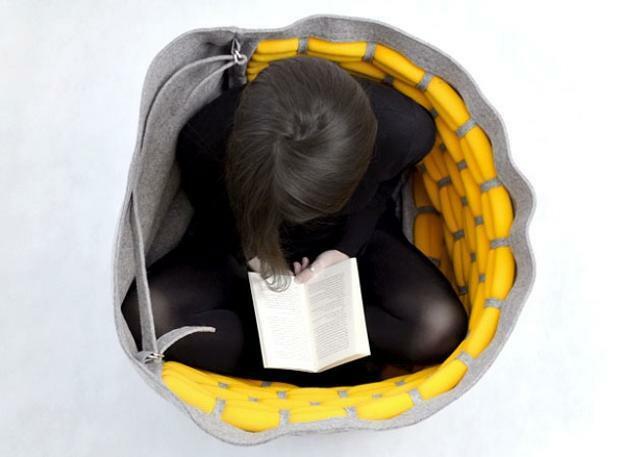 The Snug chairs can be used as ordinary chairs or as private nook, perfect for working, writing or reading. 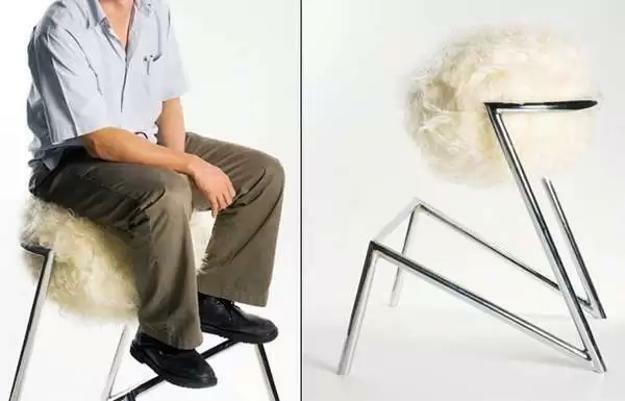 This chair design idea will be appreciated by adults and kids. 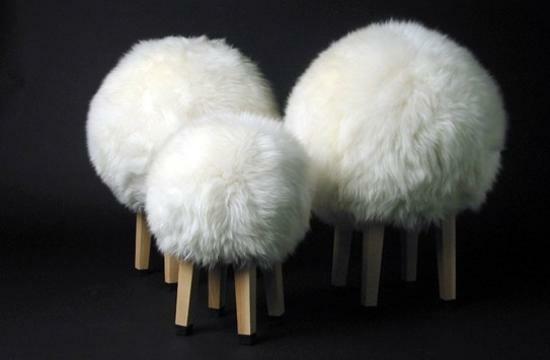 Perfect for decorating small apartments and big family homes, these unusual round chairs look stylish and comfortable. The Camp Daybed Unzips is designed by Stephanie Horning and demonstrated a stylish furniture piece for all who enjoy camping. 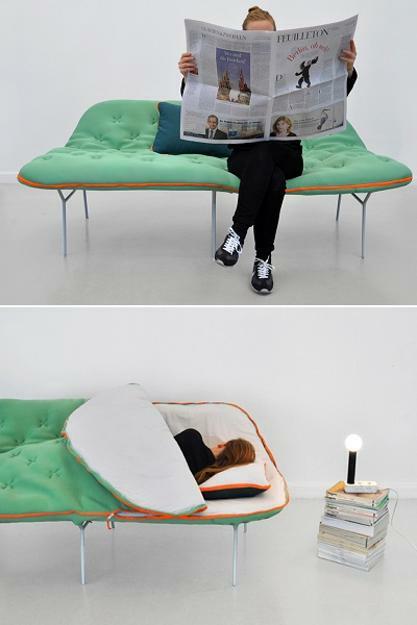 The daybed can be easily transformed into a sleeping bag.